AllegroMedical.com presents the Williams Sound FM ADA Compliance Kit. 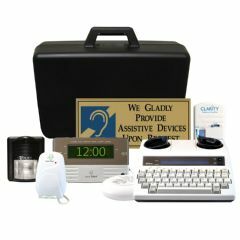 This kit provides everything you need to accommodate individuals for hearing accessibility in small-group settings such as libraries, conference rooms and information desks. This portable easy-to-use FM system operates at 72-76 MHz on one of 17 selectable channels. This single kit satisfies ADA requirements for multiple-room facilities.